homemade desserts are always healthier compared to the outside ones. So, enjoy this easy to cook Soya Kheer & have a healthy & nutritious pregnancy! Pregnancy is a time to pamper yourself with good nutrition as that is what will determine your baby's health later on. This delicious healthy soya kheer will not only please your palate but also take care of your baby's health. Soya kheer is a protein-rich dish which is a must-have for mothers, especially vegetarians who find it difficult to meet their daily protein requirements. • Soak the soya granules in hot water for 5 minutes and keep aside. • Drain the water and wash again under running water. • Squeeze the excess water and keep aside. • Heat the milk in a nonstick pan on medium heat, while stirring continuously. • Add sugar and stir continuously for 5 minutes. • Mix 1 tsp of corn flour in 1 tbsp water to make a paste and keep aside. • Add the soya granules and cornflour paste to the milk, stir well, and cook for 5 to 10 minutes, till the kheer turns thick. • Add the cardamom powder and saffron-milk mixture to the kheer, stir well and cook for a minute or two. • Cool the kheer and refrigerate for 1 to 2 hours. • Garnish with almond shreds and serve cold. Homemade desserts are always healthier compared to the outside ones. 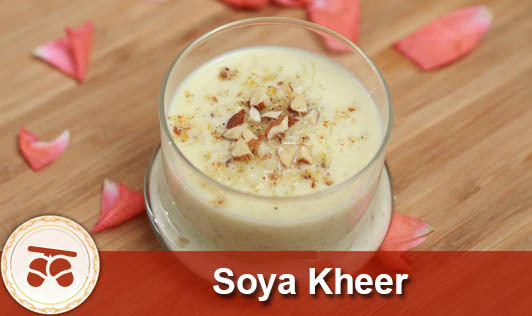 So, enjoy this easy to cook Soya Kheer & have a healthy & nutritious pregnancy!